We just came back from our vacation late last night. After all, nothing feels like home. Today is laundry/catch-up day. My husband and the little one are going shopping right now so I have a bit of "me" time. I want to do a quick post to show you a DIY project that I did last week. 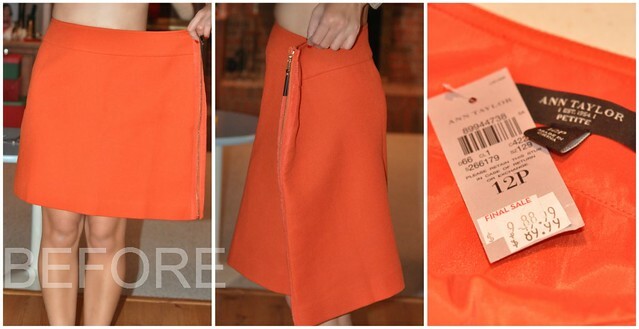 I felt in love with the Ann Taylor Modern A-line Zip skirt when it first came out but the $98 price tag was too pricey for me. By the time it goes on sale, small sizes are gone. It went on final sale last week for $9.95 plus an additional 25% off. The only size left that I found in store that day was a 12P. I decided to bring it home and do my own alterations. For $7.50, if I don't succeed, there is nothing to cry about. Here is how it looks on me pre-alterations. 1. The lining wasn't attached to the skirt (which makes my job easier). 2. Removed stitches using the seam ripper. 3. Used one of my best fitted skirts for measurements. 4. 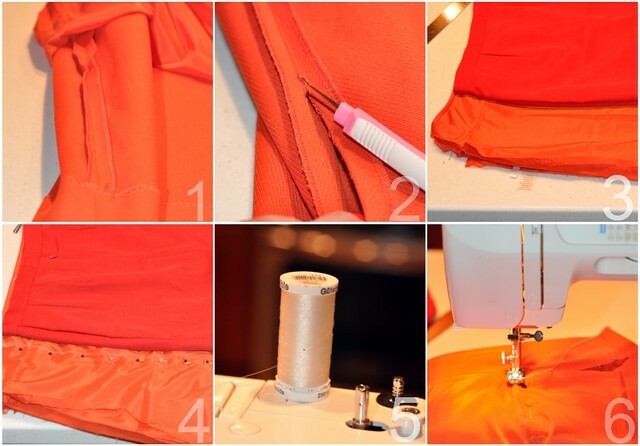 Pinned along the seam line for easy sewing. 5. I used clear thread but it's not necessary for side seams. After an hour of measuring, fitting and sewing, this is how it looks on me post-alterations. I am quite happy with the way it turned out. The color is absolutely gorgeous in person. It was meant to be an A-line skirt. Since there is an exposed zipper on the side, I couldn't do anything with the hem. However, I am happy to reshapping it to a pencil skirt silhouette. Stay tuned for an OOTD post! OMG! i can't believe you did this yourself!! its pretty amazing and what a deal for the skirt. great job! hope you guys had a fun vacation btw! hope you'll share some pics with us. Wow that is such a transformation! I haven't managed to do that yet. How long did it take you to take it in? Wow, amazing job! I wish I had your sewing skills - being able to purchase leftover sizes for ridiculously cheap so I could do my own alterations would do wonders for my budget, haha. And that skirt color is amazing! Home sweet home. Glad you made it back. Holy wow! That skirt looked super big on you. You certainly are petite. But the altered version fits you well. I like the skirt's color. Wow! What an awesome job! And for that price I wouldn't be too concerned with messing up the skirt, but it came out beautifully! I wish I had your skills. Love the color of your skirt! Extremely impressive! I wish I had such skills! I love overhauling items with some DIY magic! I was thinking, even if you found this in a 00P you probably would've needed alterations, so it's awesome that you were able to find one for a mere $7. You're improving quickly at self-alterations. Soon, you'll be whipping up garments from scratch! Great job!! Does this mean we'll be seeing more and more sewing from you? ;) I love that color and exposed zipper! WOW! A skirt from AT for $7.50! Ive never seen that kinda discount at my AT :-( Lucky you! Awesome job on the alteration! Love the zip style and the color! This is amazing! You are so talented...for a beginner this is terrific! Can't wait for the outfit post! The skirt fits you so well now! Fabulous. wow great job on altering it, gosh I would be so clueless on how to even go about it. wow, nice job! I'm very impressed. I bought a pair of 2Long jeans at TJMaxx before and hemmed it. It was one of my favorite jeans for a long time. Taking extreme sizes and altering it is the way to go! Just saw your vacation video - sounds fun. How do you finish the edge of the seams? Now I know to look for skirt without darts for DIY. Thanks for the tutorial. I really can't believe that you took a size 12 and made it fit you. You can get so many steals that way!!! Can you possibly show the step-by-step, or point us to your source of inspiration?? I'd love to alter my skirts too and you'd save me so much money!